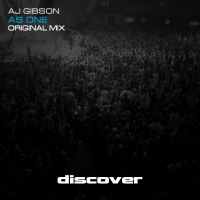 AJ Gibson returns to Discover in triumpant style with As One. Steering clear of obvious trance cliches is tough these days but AJ does it to perfection creating an intro based around a synthetic WAH WAH guitar effect that immediately grabs the attention. Big melodies fire in from all directions before dropping back into big key changes that lift the melody sky high and beyond. This is peak time trance with no messing - delivered to perfection by this talented producer. 'As One' is available now from Beatport and iTunes.